On October 1st, the German band EINSHOCH6 will start its tour in Indonesia. The tour will kick off in Denpasar with a workshop before the band is heading towards the Javanese heartland to Yogyakarta to conclude the trip. We talked with the musicians about the concept of the band EINSHOCH6 and their journey to Indonesia. Who is the band EINSHOCH6 and which goals you are following as musicians? 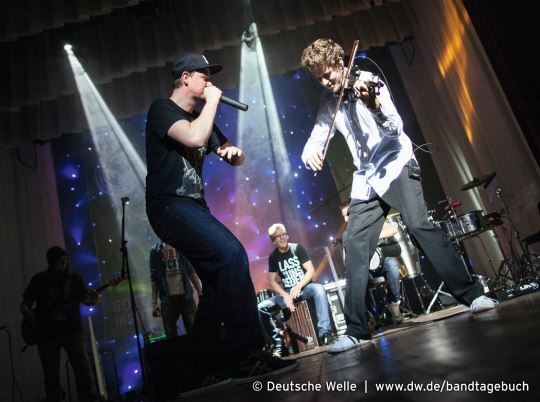 EINSHOCH6 are 9 musicians from Munich trying to combine the two genres of hip-hop and classical music. We aim to break free from musical boundaries; seeing that this approach succeeds and is well-received is a big pleasure for us, no matter if it is in a club or on the stage of a classical venue. Together with the Deutsche Welle, we developed the platform “Band Diary with EinsHoch6” which helps German language students to deepen their understanding of the language by listening to our music. For us as musicians it’s a gift to see that the combination of music and language is connecting people all around the globe. There is nothing more a musician can wish for. You already gathered a lot of international experience. What are your most beloved memories? In the last 2 years we had 16 tours abroad and for every country, city and workshop we have great memories. It is great to see this positive energy from both students and the teachers – no matter if we are in Moscow, Capetown or Barcelona. On the Ivory Coast for example, there are more than 250,000 thousand students – more than the inhabitants of a small town – and when all of them are learning German through your music, it´s an amazing thing. Have you ever visited Indonesia before? For most of us it’s the first time coming to Indonesia, so of course we are excited! Every time we travel to a country we prepare accordingly. We are very keen to interact with the people especially since we heard that music, rhythm, singing and dancing are of great importance in Indonesia. Have you been in contact with Indonesian music before? In our hometown of Munich there is a professional Gamelan orchestra which we are acquainted with so this aspect of Indonesian music is not new to us. We are always open to new influences and are looking forward to an inspiring journey! What are you expecting from the cooperation with the Indonesian students, and what are your plans for the workshops and concerts in Denpasar and Yogyakarta? We think we will be greeted warmly by the students! The workshops are not only a great input for them but also for us. Together with the students we will develop a song which we will perform live on stage afterwards. The interview was conducted by Eike Brahms. Indonesia and Germany are connected through a long friendship, be it on a cultural, economic or political level. To celebrate this long-lasting relationship, an exciting format – the German Season – was presented from September to December 2015.